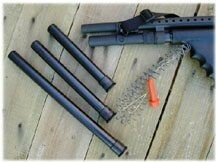 Increase your firepower with these shotgun magazine extensions. They are great for law enforcement officers and competition shooters. They are also a must for home protection. (7 shot extension fit 18" and longer barrel.). *All extensions will fit the 12, 16 and 20 gauge Remingtons. Will not fit 20 gauge light weight, youth models or express. Increase your firepower with these shotgun magazine extensions. They are great for law enforcement officers and competition shooters. They are also a must for home protection. (7 shot extension fit 18" and longer barrel.). *All extensions will fit the 12, 16 and 20 gauge Remingtons. Will not fit 20 gauge light weight, youth models or express.